I just saw a five car bumper to bumper accident on Storrow Drive. Well, I heard the first crash and then saw four cars slam into each other. 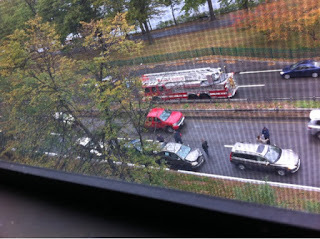 Storrow Drive is right outside of my window and generally, cars are driving really fast on it. So if one car hits another, there is barely enough time to stop, which is why a five-car collision is possible. In the picture below, you can only see four of the five cars. The last white car took off pretty quickly after the police arrived. So my guess is that maybe as the fifth car in the chain of collisions, there was minimal damage, if at all, and the driver was a busy person and needed to go. And no one seems to be seriously injured, so that's good! The front of the second car is pretty deformed and a good portion of the third car, the blue car, is underneath the second car. And you know what I realized, there's still a novelty in a car crash. When I heard that first initial slam, I immediately thought it out of the ordinary and looked out my window, to see the other four cars hit each other. And you know what, it's nice that car crashes are still a rarity. Storrow Drive is always full of cars and I've kind of gotten used to the sound of a constant traffic. I don't look out the window when I hear a car drive by. Living in Boston in general has made me not as mindful of traffic. Now imagine if I was accustomed to hearing car crashes to not look out the window? That would be AWFUL! Gah! Something would have to be seriously wrong with our society if accidents weren't out of the ordinary. As I'm looking out my window now, I notice a black SUV. And a woman dressed in black with high heels getting out of it. Maybe she's a detective. She looks to be examining the scene. Yes, I will call her a detective. Now, wouldn't that be a cool job! A detective. Solving crimes.